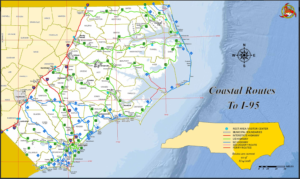 Evacuations due to Hurricane Florence will congest major roadways. If you are traveling in from the coast, know that I-40 and US 64 are not your only routes. The North Carolina Department of Transportation has provided alternate routes to reach your safety destination. Map your route. Courtesy of North Carolina Department of Transportation. The ReadyNC app gives information on real-time traffic as well as weather conditions, river levels, evacuations and power outages. For people living in or visiting North Carolina, this is an all-in-one free tool for emergency preparedness.